ACCIDENT FREE, 1 OWNER ONLY, WARRANTY UNTIL DECEMBER 9TH 2022. AWD, GPS, PANORAMIC MOONROOF, PANORAMIC BACKUP CAMERA W/ FRONT AND BACK PARKING SONAR AND REAR CROSS TRAFFIC ALERT, HEAD UP DISPLAY, PRE COLLISION SYSTEM, LANE DEPARTURE ALERT, BLIND SPOT MONITOR, F SPORT LEATHER INTERIOR, ELECTRIC, HEATED AND VENTILATED FRONT SEATS, AUTOMATIC DUAL ZONE CLIMATE CONTROL, PREMIUM MARK LEVINSON AUDIO W/ 12.3’’ DISPLAY / AM / FM / CD / MP3 / 2 USB PORT / BLUETOOTH, INTEGRATED SATELLITE XM RADIO W/ 15 SPEAKERS, F SPORT LEATHER WRAPPED / HEATED AND POWER ADJUSTABLE STEERING WHEEL W/ PADDLE SHIFTER / AUDIO CONTROL / BLUETOOTH AND DYNAMIC RADAR CRUISE CONTROL, AUTOMATIC HIGH BEAM (LED), TOUCH FREE POWER BACK DOOR, POWER REAR FOLDING SEATS, RAIN SENSING WIPER, WIRELESS CHARGER AND MORE. F SPORT III PACKAGE. THE MOST EQUIPPED F SPORT VERSION. 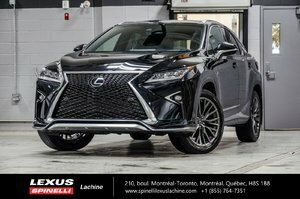 TRADE-IN VEHICLE FORM A REGULAR GUEST FROM SPINELLI LEXUS LACHINE. Cylinders : 3.5L Engine @ 295 hp / Torque 268 pd-ft - V6 cyl.